Men’s fashion blog finds a unique way to convey fashion through old friends and a new lens. It was 8:00 PM on Sunday, May 27th. I’d just boarded the Megabus at the station just outside of Midtown Manhattan New York City. Words can’t describe how happy I was to finally be able to kick my feet up after a hard days work and head home to Philly. What brought me to the Empire State you might ask? None other than my first love: Photography. I’ve touched on it here and there in other articles but I’m a pretty decent amateur photographer. So good that with just some skill and admittedly, a touch of nepotism, I was able to land a job as the full-time photographer for a fashion blog by the name of “A Gentleman's Touch”. 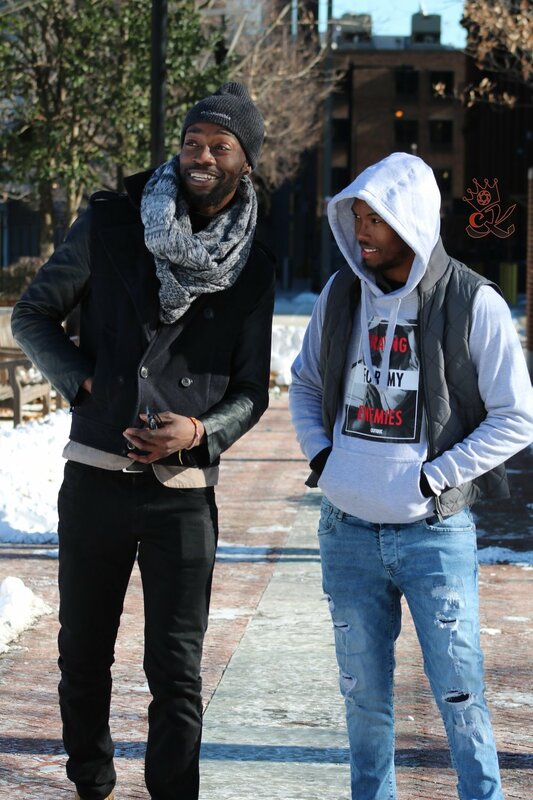 The blogs are written and curated by a young fashion enthusiast by the name of Keith "KayJay" Jones-Nwankwo (left). KayJay and I were associates in high school. We bumped into each other one day when I visited a retail clothing place where he happened to work. We reminisced about the old days for a bit and he complimented me on my personal style. After a long conversation where we talked about everything from women to work, we parted ways with me encouraging him to check out my work on Instagram. Weeks later, KayJay came to me after seeing my work with a proposal to come work with him for his blog. Enthused with the idea that someone genuinely enjoyed my work, I agreed to work with him for 6 months as the head photographer for fashion shoots where he’d style and dress some of his friends and family. The shoots would be themed around the season along with popular trends in men’s styles. As promised, I showed up once every month for five months and brought my A game to every shoot. On the sixth month, KayJay wanted to end our run with a bang so we planned a trip to New York as the final shot. The day finally came and KayJay and I sped off to New York with two models determined to work, play, and eat. For nearly 10 straight hours, we trudged through the streets of New York shooting pictures all throughout Manhattan and Harlem. The shoot was one of the best times of my life and, though my feet were cursing me out for walking around in combat boots, I’m truly proud of the work we did out there. Thinking back on it now weeks later, the whole experience revived my love for men’s style. I’d always been a fashion enthusiast but my love for it tended to fade from time to time. Most of that fading had to do with the fact that men’s style is still kind of a niche interest and, in a world of personalized media and cult followings being brought to the forefront, that’s no simple accomplishment. This is especially true of black men’s fashion. It goes without saying that African American men are a big part of what shape the landscape of the fashion world. We’ve seen countless black male celebrities draped in designer brands that get a sales boost after these sometimes unintentional endorsements. Fast fashion brands like Old Navy and Zara even try to mimic styles coined by black men. This is more fascinating when you consider that the point of fast fashion brands/stores is to make the most popular styles in the designer world affordable. You’d think this would culminate in a “we made it y’all! !” or, for the more sophisticated (bourgeoisie) individuals, “The fashion world finally respects people of color enough to honor our aesthetic and include us”... Leave it to an industry still infested with powdered wigs and a still visible racism to make that inclusion conditional at best. Most ads at fashion retail spots will try to include at least one black guy- maybe even two or three if they recently faced public lambasting for their portrayal of a black child (y'all know who I’m talking about *sips tea). Despite this sparse inclusion, most of the black men depicted are light-skinned to the point of being racially ambiguous or exotic to the point where you start to wonder if the photographers and execs ever saw an American black guy. Now you might be thinking to yourself “what's the big deal? Of course, models are exotic and different looking. That's typical”. Well, when you consider that racial ambiguity and exotic features are juxtaposed with all-white, all-American Tim with a popped collar and a Colgate grin, it starts to feel like something is… not quite right. It’s rare that you see your average everyday black male in a shoot and this was something that I was particularly proud of while working with KayJay. The guys we shot with, Ironically, reminded me of the guys who brought all the latest and greatest gear to dress down day in high school. There was something relatable that I could find in each and every one of the models we shot with. Though it was technically unintentional, KayJay’s A Gentleman’s Touch blog brings a unique aesthetic to the fashion world that we rarely see: Average (albeit fashion forward) men of color. As someone who prides himself in being different, I have no doubt KayJay is proud of this too. KayJay has been through numerous challenges with the A Gentleman's touch, not the least of which is him having to close up shop for a while when he had to part ways with his original models because of distance. His determination is second only to his sense of style and I can’t wait to see his trajectory.